The Enraged Corrupted Rex will rarely spawn during an Orbital Supply Drop raid. The Enraged Corrupted Rex is one of the Enraged Creatures in ARK: Survival Evolved's Extinction expansion. 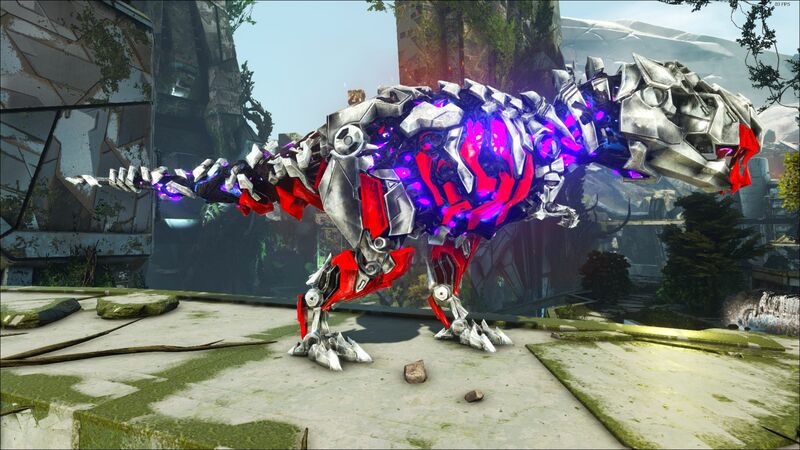 It resembles a Tek Rex, but infused with Corruption; it also has a distinguishable red aura much like the Alpha Predators. 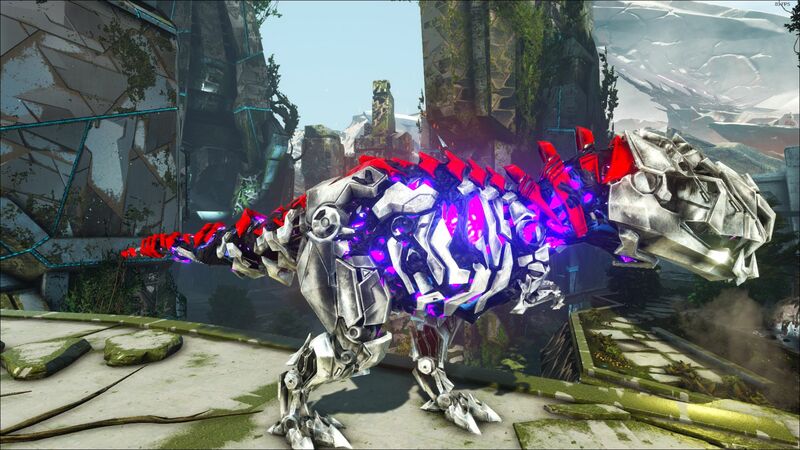 This section displays the Enraged Corrupted Rex's natural colors and regions. 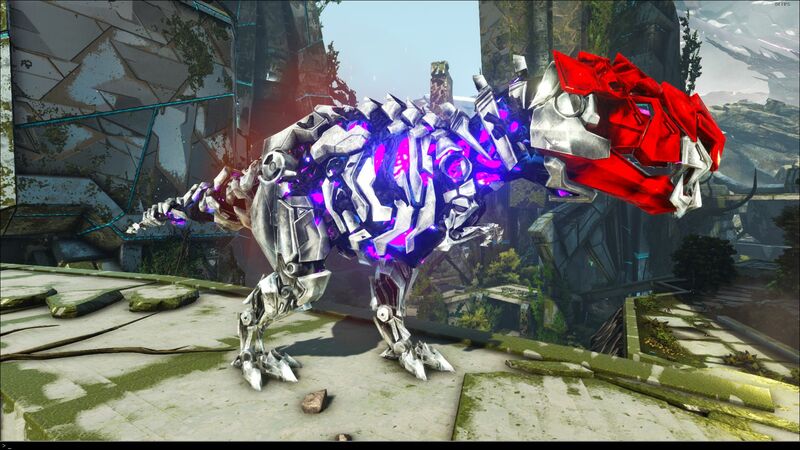 For demonstration, the regions below are colored red over an albino Enraged Corrupted Rex. The colored squares shown underneath each region's description are the colors that the Enraged Corrupted Rex will randomly spawn with to provide an overall range of its natural color scheme. Hover your cursor over a color to display its name and ID. 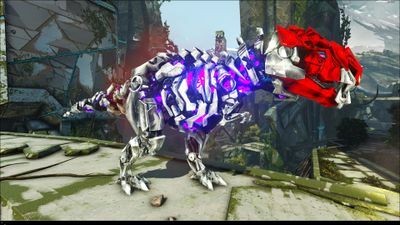 For example, "cheat SetTargetDinoColor 0 6" would color the Enraged Corrupted Rex's "dark muted-g" magenta. 5The Enraged Corrupted Rex is incapable of drowning. 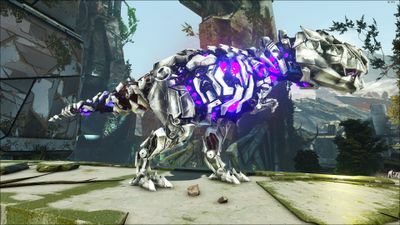 The Enraged Corrupted Rex will most often be found during raids of the Legendary Orbital Supply Drops, meaning it will almost always appear with levels around 500. 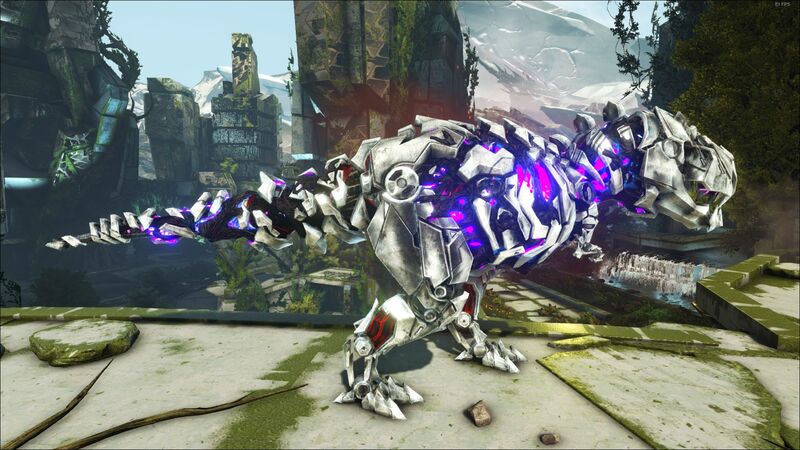 Upon defeating the Enraged Rex, you'll obtain an Alpha Tyrannosaur Tooth, necessary for the Alpha King Titan. During the raid, if an Enraged Rex is present, all other Corrupted Creatures will receive half damage, making it a priority to kill. Use an Enforcer as they deal four times their normal damage on Corrupted and Enraged Creatures. Be mindful of the Enforcer's health though, as it does significant damage. Another method is to use a Managarmr as its ice breath can be a good method if you want to stay away from the Enraged Corrupted Rex. Just make sure to have other dinosaur nearby to deal against it as it cannot be frozen again for a while. Fighting on foot is definitely a bad idea, but if necessary, utilize the best shotgun with high damage per shot that is available in the arsenal, along with a fully powered Tek Suit to get far away if it gets too close. Like Alpha T-Rexes, Enraged Corrupted Rexes can kill most tamed dinos with relative ease and shred through any sort of base. Coupled with the fact that it halves the damage taken to any nearby corrupted/enraged creature makes it a much more dangerous creature to deal with. While Enraged Corrupted Rex in a bundle can become an issue, isolating the Rex away from other corrupts will allow for an easy kill. Just make sure to eliminate corrupted creatures approaching towards it before they get too close. Despite being made of Tek and corrupted by the raw Element, it still drops Alpha Tyrannosaur Tooth on death, which came from living Rex, or more specifically, Alpha Rex.